A considerable number of purchasers raved about how comfortable the Puma Zenvo felt. The shoe was reported to fit true to size and width; the buyers went with their regular athletic shoe size. The style and colors of the footwear were adored by a myriad of users; it worked well for going out, was easy to match with different outfits, and won its wearers lots of compliments. The trainer was durable and made of quality materials, according to many comments. It proved to be a great companion for spending a lot of time on feet walking or working; a few people also enjoyed its performance at the gym. Most testers described the footwear as lightweight. It was easy to slip on and remove, based on several reviews. Only one person felt the need to break in the trainer in the beginning. The Puma Zenvo won the adoration of many female customers. Even though the shoe was originally created for workouts, its style and comfort made it an absolute favorite for everyday walking and casual wear as well. The footwear received next to no negative comments and was considered a success in all departments. The Puma Zenvo is a daily workout shoe which caters specifically to female wearers. 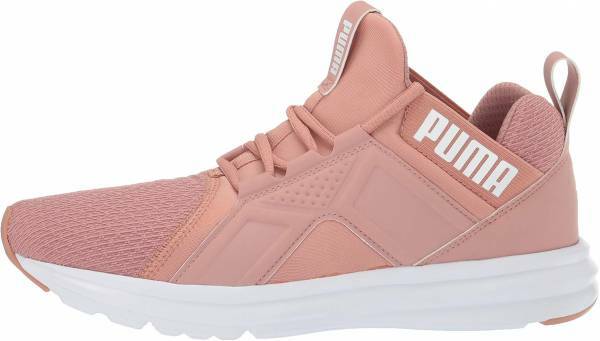 The long-time Puma fans might have noticed that the style of the trainer as well as the materials used are identical to the ones of the Puma Enzo. The two are basically the same shoe, only the Zenvo model is available just for ladies. The Puma Zenvo comes in a range of women’s US sizes, from 5.5 to 11, and generally runs true to size. In terms of width, it is only offered in a standard B - Medium width profile. The shoe sports a bootie silhouette with two stretchy gore straps on the sides. It allows for an easy on-and-off action together with the front and back pull tabs. A synthetic midfoot cage is integrated with the laces to help in adjusting the tightness of the fit. The largest portion of the outsole is comprised of the foam material which is also used in the midsole unit. Such construction keeps the weight of the trainer low. Various flex grooves line the unit both vertically and horizontally. They contribute to the flexibility of the platform, helping it bend in multiple directions. The outsole is reinforced with two durable carbon rubber pods: one of the heel and the other one at the toe area. Placed in the most high-wear areas, these pods increase the shoe’s longevity. A full-length EVA foam unit serves to provide consistent cushioning and impact attenuation. This material is made lightweight and flexible to promote easy and natural foot motion. It works together with the SoftFoam insert. The latter contributes to the underfoot padding and comfort. The Puma Zenvo employs a bootie design which is meant to keep the ankle supported with its extended tongue and heel. At the same time, the carved-out collar with side gore straps makes sure that the ankle mobility is not hindered. This training shoe uses two types of materials to deliver a balance of support and flexibility. The toe box and the heel collar are made of jacquard mesh. It keeps the footwear breathable while also adding a stylish touch. The midfoot and the tongue feautre a polyester fabric to render a firmer foothold to the area. There are firm synthetic reinforcements placed on the midfoot and around the heel. The panels on the midfoot form three pairs of eyelets which allows them to integrate with the laces and hug the foot tighter when the laces are cinched.